Shawn Atleo, the former national chief for the Assembly of First Nations, signed off on amendments to the federal government's controversial aboriginal education bill after an initial draft was rejected by First Nations, documents filed in federal court show. The government filed the document in federal court on Wednesday as part of its defence against a bid for judicial review launched by the Assembly of First Nations of Quebec and Labrador in an effort to overturn the government's First Nations Control of First Nations Education Act. The four-page undated agreement — signed by Prime Minister Stephen Harper, Aboriginal Affairs Minister Bernard Valcourt and Atleo — notes a number of "substantive amendments" were made to a draft of the First Nations education bill proposed by the Conservatives in October 2013. That first draft drew the ire of First Nations who argued it did not give them enough control over aboriginal education nor did it guarantee new funding. The court document shows the draft bill was amended to "require that elders, parents and students be meaningfully involved in the decision making processes in their community's education." It was also amended to require that statutory funding "account for language and culture programming." While other sections remained unchanged from the first draft of the bill, the door was left open to further tweaking. "This does not preclude minor adjustments to wording or tone," the agreement said. On Feb. 7, Harper flew to Alberta where he stood side-by-side with Atleo and Valcourt before a gathering of First Nations chiefs to announce a $1.9 billion in federal funding for aboriginal education starting in 2015. "The legislation will end Ottawa's unilateral authority over First Nations education while requiring First Nations communities and parents to assume responsibility and accountability for the education their children receive," Harper said at the time. The document is titled "Bill C/S-X, First Nations Control of First Nations Education Act," which indicates the government had yet to decide at the time the agreement was signed whether it would introduce it in the House of Commons or the Senate. 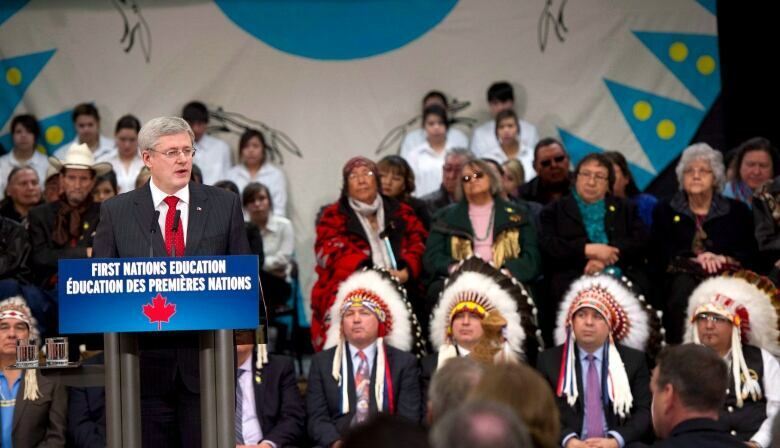 The government tabled the First Nations Control of First Nations Education Act in the Commons on April 10. The federal government argues the document filed in court Wednesday shows Ottawa did, in fact, agree to amend the draft bill to reflect conditions laid out by First Nations after their first proposal flopped. "This document shows the extent to which our government worked with the Assembly of First Nations' leadership to create a bill that would best serve the interests of First Nations students," said Valcourt's office in a statement to CBC News. "We continue to urge the AFN to honour its signed agreement so we can move forward with the priority of getting kids a good education." The government maintains the education bill will stay on hold until it receives the support of the AFN. The bid for a judicial review of the bill was launched by the AFNQL under the leadership of Ghislain Picard, who on Wednesday announced he will run for national chief of the AFN. Picard has argued in documents filed in federal court the government failed to consult First Nations on the aboriginal education bill. He has also claimed Atleo failed to inform members of the AFN executive he had reached an agreement with Ottawa after the first draft was rejected. On Wednesday, Picard told CBC News a deal between Atleo and the federal government doesn't bind other First Nations to the education bill. "Chiefs across the country have supported the notion that an agreement, if you will, with one individual doesn't make it an agreement with all First Nations," said Picard. 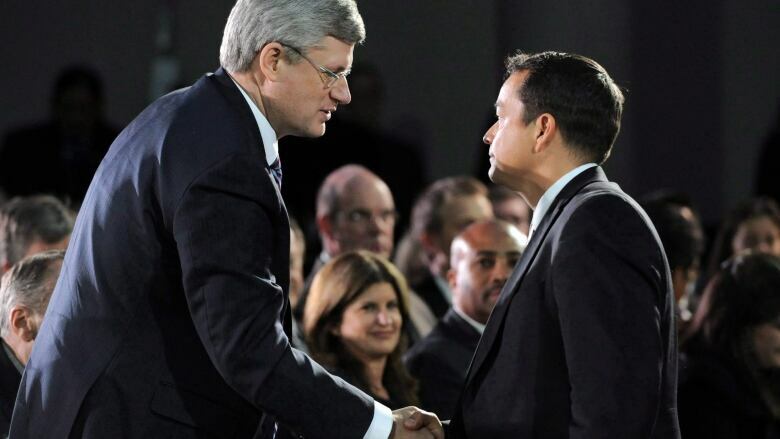 Atleo quit the AFN last May amid criticism from First Nations leaders that he had grown too close to the federal government given his support for the bill. He has not made himself available for interviews since his sudden departure. The case will be heard in federal court in Montreal on Sept. 22.